Sharpen your leadership, management and advocacy skills with NALAC in 2017. 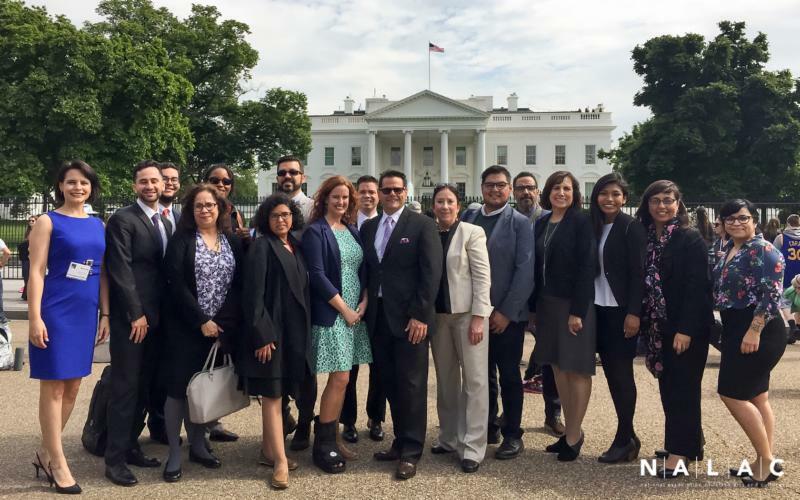 2016 NALAC Advocacy Leadership Institute participants gather after their meeting with White House staff. As Latinx artists and cultural leaders, you are at the forefront of movements that speak truth to power and we encourage you to advocate with us as we move forward with purpose. The Latino community is no stranger to bigotry and injustice and it is this reality that keeps us engaged in struggle and resistance. Be aware of the legal and social consequences that this new administration will bring to bear but do not live in fear. Continue to organize and let's remind ourselves of our collective power to challenge injustice. 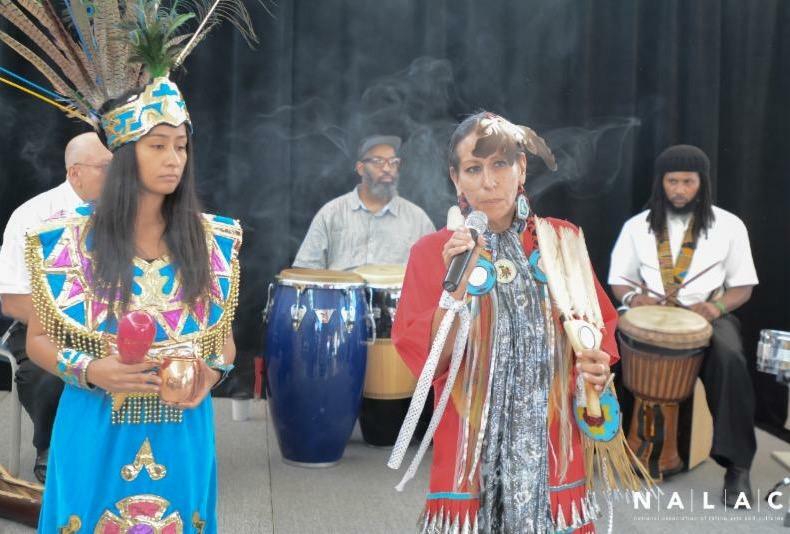 Be assured that NALAC will continue to promote and cultivate the voices of the Latino arts and culture field, support leadership development, invest in artistic production and advocate for equitable policies and practices that impact our communities. The 2016 election cycle reverted into a process streaked with the most abhorrent expressions of hatred fueled at the forefront by one man, guided by white supremacy, supported by privilege of whiteness, and tolerated by many in our society. This election represented a backlash to a changing nation by a sector of society with a deep fear of their diminishing political power due to demographic shifts. The vile language of racism, misogyny and xenophobia promulgated by the new president-elect and his supporters should not have surprised us; as members of communities of color, we live with institutionalized forms of racism and prejudice every day. Despite the new president-elect's inclination to allow racism and calculated systems of prejudice to enshrine his administration, we hear that the prescribed course of action is to give him the benefit of the doubt; however we anticipate austere policies will emerge from the new Congress and Administration and NALAC will continue to advocate and push for equitable policies for the arts. In solidarity, I share with you the message I sent my family the morning after the election, "We have struggled over generations for the right of all people to live with dignity and justice and have stood against bigotry and racism. Continue to hold your heads high and be proud of who you are and teach your children to do the same. For no bigoted sector of this nation defines your value. Carry your Grandparents T.A. and Lela in your hearts and remember the trials they faced and their courage. They faced each day with great love for their family and with the hope and dream that their struggle would bring a better tomorrow. You, my brown eyed children of the sun are the world's bright future." NALAC is committed to investing in the artists and arts professionals who constitute the Latinx arts and culture field, which stretches across disciplines, geographies, and experiences. In last year's dynamic cohort there was a scholar starting a Latinx cultural center at a midwestern university, a spoken word poet chronicling the LGBT experience and gentrification in San Francisco, a curator responding to the binational San Diego/Tijuana ecosystem, an executive director of a creative youth development organization in New Mexico, a young actor organizing black and brown performers in Detroit. Do you know someone who might benefit from NALAC's professional development opportunities in 2017? 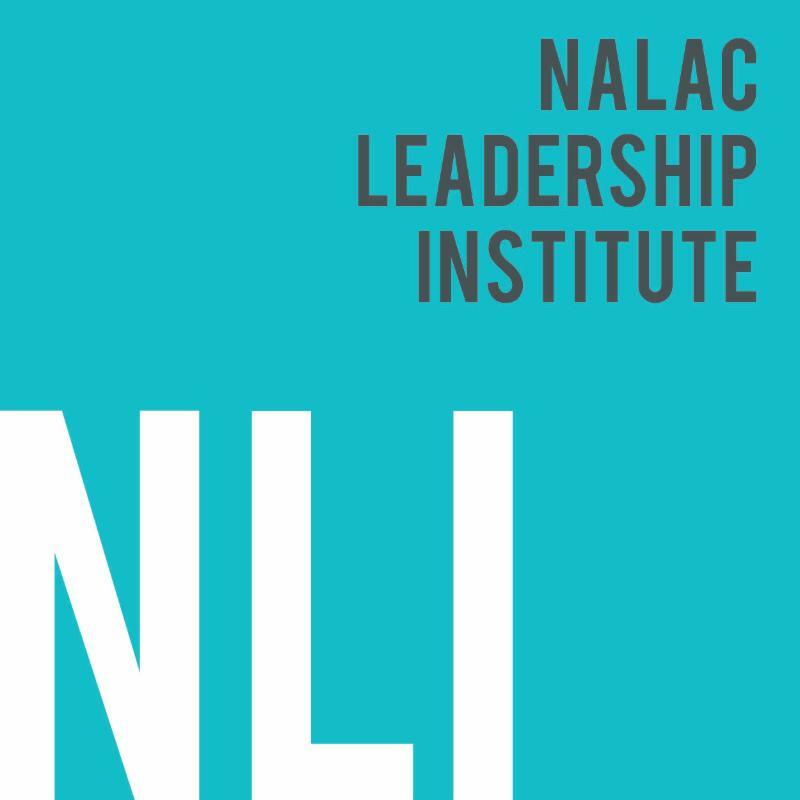 The 17th NALAC Leadership Institute (NLI) is an intensive weeklong course focusing on leadership, management, and aesthetic practice. The NLI will take place in San Antonio on July 10-15, 2017. Visit the NLI website to learn more and download the application guidelines. The 7th NALAC Advocacy Leadership (ALI) Institute includes a virtual two-month preparatory curriculum and three-day intensive course in Washington, D.C. Dates for the 2017 ALI in April or May will be finalized according to the congressional calendar. Visit the ALI website and download the application guidelines. The Mexic-Arte Museum's Screen It! program (Austin, TX) and Inquilinos Boricuas in Accion's Youth Development Program (Boston, MA) were presented the 2016 National Arts and Humanities Youth Program Award by First Lady Michelle Obama in a ceremony at the White House. It's almost that time of year again for Giving Tuesday, the nonprofit world's response to Black Friday and a chance to give back to organizations that enrich our communities. This year we are asking you to support NALAC's Giving Tuesday campaign #GiveAGigabyte to invest in NALAC's technology and computers. Our Database and Digital Media Specialist Luis Garza is quite the tech wizard. Luis has been refurbishing and upgrading our computers for years, but the time has come to make critical upgrades to our systems. Support NALAC this year on Giving Tuesday. Help us reach our goal to raise $5,000 for technology upgrades in order to more efficiently support artists, cultural workers and arts organizations. Stay tuned! The NALAC Michigan Latinx Arts Summit was an incredible day. More than 150 artists, arts professionals, educators, organizers, and community leaders convened to a create a space responding to the work that is happening and the work that remains surrounding questions of statewide collaboration, equity, advocacy, and interculturality. Panelists represented Detroit, Flint, Saginaw, Grand Rapids, and Kalamazoo. Yosimar Reyes delivered a timely keynote focusing on documenting joy and shifting the narrative about the undocumented experience and who is worthy to be called an American. Our work in Michigan, made possible with support from the W.K. Kellogg Foundation, is entering a new phase focused on research. We are especially thankful to Michael Reyes, who served as our Michigan Program Associate. View photos by Lisa Luevanos (NLI '16) from the Summit here. NALAC is proud to work alongside Arts in a Changing America for a more equitable arts and cultures field. ArtChangeUS REMAP: Detroit brought together artists and changemakers at the Wright Museum and throughout the city to explore how the arts are driving a changing America and transforming communities. 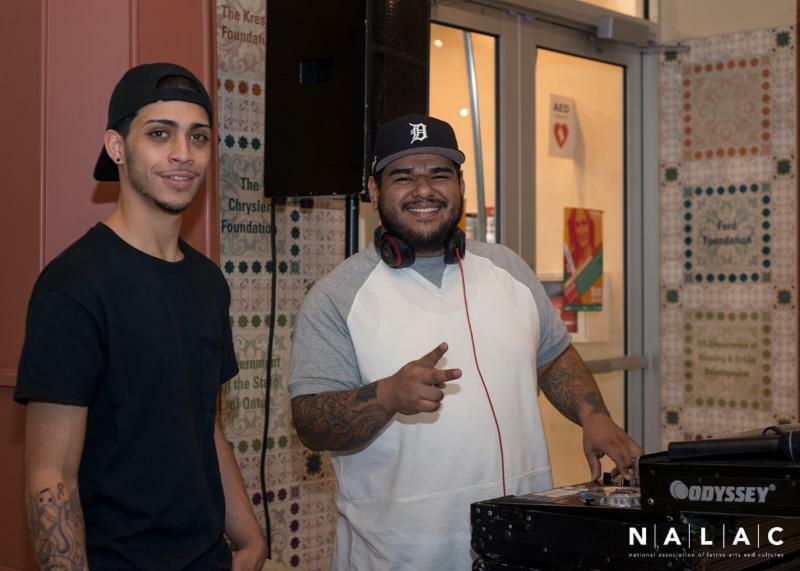 A joint reception at the Arab American National Museum wrapped up REMAP and launched the NALAC Michigan Latinx Arts Summit. Click here to view photos. In my case, a quick google search for "Latin American Studies jobs" led to my internship here and what has become a unique opportunity to organize, connect, and support individuals working on behalf of their diverse communities across the country. If you know anyone who might be interested in joining our team on the ground in San Antonio or remotely, we'd love to meet them." - Gabriel Magraner, NALAC Director of Programs. Click here to learn more about our internship opportunities. Betty Avila (NLI '16) was named to C-Suite Quarterly's NextGen 10 in Philanthropy, Art & Culture. Avila is the Associate Director of Self Help Graphics & Art located in Los Angeles. 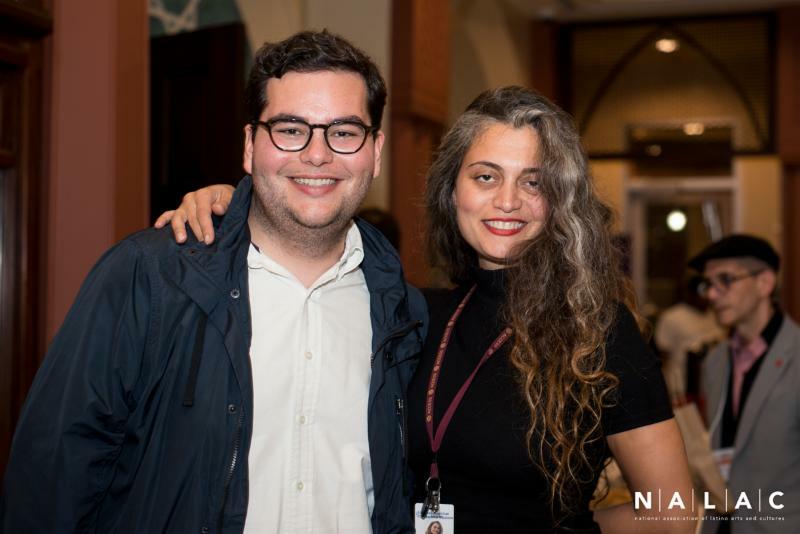 David Lozano (NLI '14/ALI '16) is in the news for his crucial advocacy work in Dallas; read his interview with D Magazine: A Bold Plan to Bring Arts to All of Dallas.Lozano is the Executive Artistic Director of the Cara Mía Theatre Company. Latin@s in Heritage Conservation will hold its second national convening November 18-19th in Houston, TX at Talento Bilingue de Houston. Meet and exchange ideas with practitioners and advocates for Latin@ historic preservation on topics such as: Local & National Priorities, Tangible & Intangible Heritage, & Alternative Methods of Documentation. The Reunión is open to all interested in preserving our nation's diverse Latino heritage. It's not too late to register. Click here for details. "The update to the U.S. Department of Labor's Fair Labor Standards Act (FLSA), which increases the salary threshold for employees required to received overtime compensation, takes effect December 1, 2016. On that date, full time employees who receive a salary less than $47,476 per year (an increase from the current $23,660 per year) are required to receive overtime compensation if they work more than 40 hours per week, regardless of whether they qualify for the executive or administrative exemptions. While there are several legislative efforts that support a phased-in implementation, dance companies and businesses should prepare for the update to take effect on December 1." Dance/USA, the national service organization for professional dance, has prepared an informative resource guide for Overtime Regulations; download it here. The Immigrant Legal Resource Center has put together an important document: Post Election Talking Points and Resources focused on DACA. The National Immigration Law Center developed a "Know Your Rights" Fact Sheet. NILC is also recommending: "If you do not currently have DACA and are considering whether to apply for it for the first time, we recommend that you not do so at this time. If you already have DACA and are considering whether to apply to renew it, immigration authorities already have the information on your original application, so there is less risk in submitting the renewal application." Click here for more information. Carlos Aguiar, a graduate student at the University of Texas in San Antonio penned this Letter from a DACA student. The Soros Equality Fellowship supports emerging midcareer professionals who will become long-term innovative leaders impacting the racial justice field. The fellowship award includes$80,000 to $100,000 over the course of the fellowship period, accompanied by the requisite skill building, mentorship, and support to ensure a fluid leadership pipeline between early-career promise and later-career expertise. This approach recognizes the power of individuals to use a variety of tools, from traditional advocacy to the arts, to impact change and uplift the mission and values of an open society. Letter of Inquiry Deadline: November 16, 2016. Click here for details. NALAC | To nominate someone (or yourself) to serve on a NALAC panel please fill out this form. Our panels represent a diversity of Latinidades, experiences, generations, and disciplines. NEA | The National Endowment for the Arts (NEA) is always looking for individuals with experience and expertise in one or more of the arts to serve as grant review panelists. Please emailpanelistforms@arts.gov for additional information.